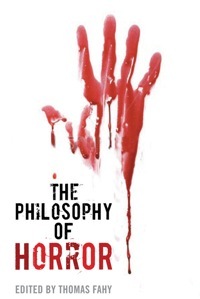 The Philosophy of Horror (2010) makes me wonder if it’s not horror criticism that’s in a bit of a crisis. With the release of American Horror: the genre at the turn of the millennium and The Philosophy of Horror in late 2010, there was a sudden onslaught of essays that promised fresh perspectives on the horror genre. While American Horror certainly delivered in introducing some of the first texts on horror film produced in the last decade, The Philosophy of Horror (edited Thomas Fahy) regurgitates many of the old philosophies to a seemingly non-horror audience (i.e. it’s very basic). This sameness isn’t productive and it isn’t really re-productive, it’s actually non-productive. A good comparison is the analysis of Land of the Dead seen in both books; Craig Bernardini’s Cronenburg, Romero, Twilight of American Horror Auteur proposed new readings of the evolved zombie in a contemporary context while John Lutz’s Zombies of the World offered an extremely didactic examination. Noel Carroll’s The Philosophy of Horror (1990) was mentioned in so many of the essays (indeed all but a few don’t) that I wondered if this was an editorial requirement. Carroll’s philosophies of what and how horror operates are definitely an important marker of horror study but they are also antiquated. His inclusion certainly makes sense because this new version is an aptly titled proposed extension of his book, however this relationship could have easily been taken care of in the introduction or more provocatively in an essay devoted to dismantling some of his ideas. There are also numerous and seemingly obligatory references to Carol Clover’s Men, Women, and Chainsaws (apparently the only bit of gender theory worth citing) and the man himself, Sigmund Freud (where would we be without the return of the repressed or the uncanny?). In a philosophy-focused book the inclusion of Freud is inevitable but I was much more interested in Robert F. Gross’ Shock Value: a Deleuzean Encounter with James Purdy’s Narrow Rooms. Taking the more progressive and ‘becoming’ ideas of Deleuze and Guarttari is one way in which horror academics can look forward, asking what this horror film (book, ride, game) does rather than asking what it means. Of course this is not a new approach either, as seen in Anna Powell’s exhaustive and insightful book Deleuze and the Horror Film (2005). Regardless of who’s being cited, it’s actually the relentless usage of other people’s thoughts in order to back up the writer’s content that’s tiring in most of the essays in The Philosophy of Horror. Lorena Russell’s Ideological Formations of the Nuclear Family in The Hills Have Eyes is a good example. I’m not knocking these references, they are fantastic, useful, and necessary in one’s developmental understanding of the history of horror, however it seems time for a radical change in the philosophy used and the horror material it’s being used on. I mean, I know what Freud thinks…I want to know what you think, now, in 2010. My complaints about using older films and philosophies aside I will make one exception: Paul A. Cantor’s The Fall of the House of Ulmer: Europe vs. America in the Gothic Vision of the Black Cat. It’s a director-centered piece looking at modernity versus tradition through Ulmer’s (and Hollywood’s) dual relationship to Europe and America post-WWI. By using architecture and psychoanalysis as motifs in this essay Cantor, who also incorporates Deleuzian and Guarttari ideas along with Heidegger, unfolds how history plays out and can recuperate itself in cinema. What makes this writing different is that Cantor’s references make sense precisely because of the historical context in which The Black Cat was placed – during the rise of modernism and psychoanalysis. It’s not looking back in philosophy for answers, it’s looking during that time for understanding.